The sharp fall in degrees made Kashmir Valley, especially the Shopian district, kneel to the heaviest spell of snowfall on Friday but while schools in some areas were forced to shut down, the precautionary move could not stop little children from stepping out of their homes and chilling in the thrill of the snowcapped area. 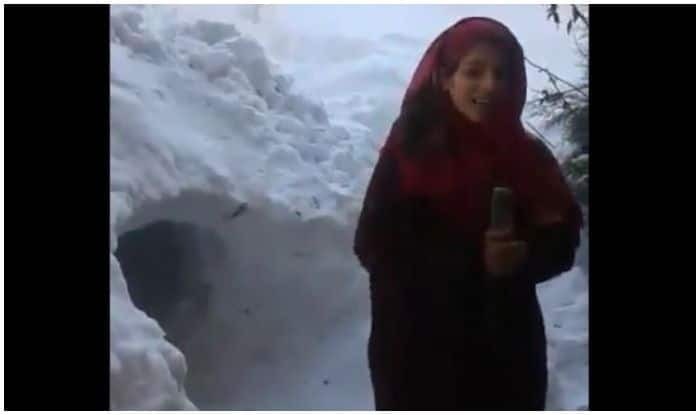 In a video that is currently trending on micro-blogging site Twitter, a teenage girl from the Shopian district of Kashmir can be seen reporting about the snowfall with the complete aura of a budding journalist. Holding a marble slab in a microphone position, 15-year-old Eiduha Iqbal gives details of a secret tunnel, describes how the accumulated snow had almost reached the height of the first floor and little kids can be seen chilling in a successfully built hide-out under the snowcapped surroundings. Taking interviews of the two children who built the quirky hideout, Eiduha tries to hold a serious question answer round in her attempt to know more. Trending for all the right reasons, the one minute 19 seconds video is being lauded by journalists across the country and Twitterati too, applauding the girl for her professionalism and reporting, while some even suggesting her to take it up later as her career. Though this season’s snowfall has dispelled fears of water shortage in rivers, lakes, streams and springs in the coming summers, an avalanche destroyed a house in Kokernag area of Anantnag district late on Thursday and reportedly six policemen, two Fire and Emergency Services personnel and two prisoners have gone missing after another avalanche hit a police post near the Jawahar Tunnel on the Jammu-Srinagar Highway. The police said that the relief and rescue efforts on Friday have traced one of the missing. Meanwhile, the local administration has ordered rationing of petrol and diesel till the supply position improves after an alarming rate of petroleum products, mutton, poultry products and vegetables vanished from the markets in Srinagar and other places in the valley.